Superman and Bizarro save a crashing airplane in the heart of the city, but not before Bizarro went in the opposite direction to what Superman said, tore the wings off the plane and nearly doomed everyone involved. Tests back at STAR Labs show that the neurotransmitters are still in place and there's no medical reason Bizarro's thoughts should be turning chaotic. Superman suggests it might be psychological, Hamilton thinks maybe he can just adjust Bizarro's meds, and Bizarro takes off, leaving a Bizarro-shaped hole in the wall. Outside, Bizarro is attacking the STAR building and speaking like he's trying to sound like his old self. 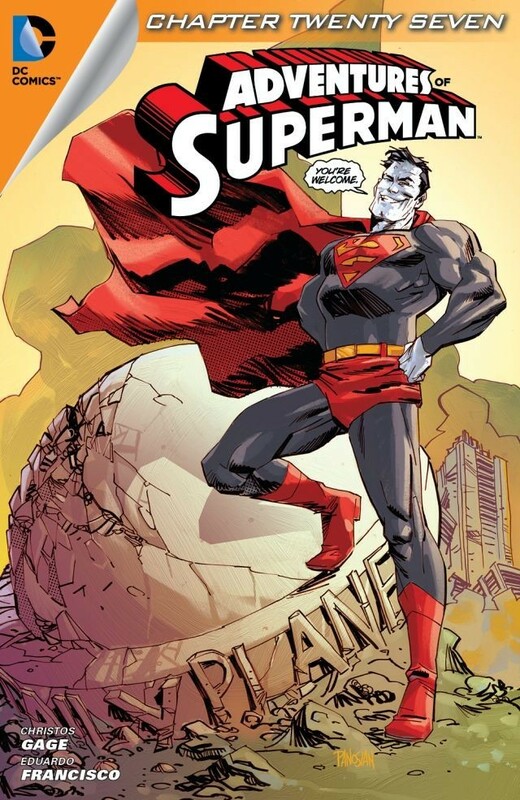 Superman flies off with him to a remote location, where after a few words Bizarro asks why Superman couldn't just kill him, that it would be so much easier. Superman says he just needs time but Bizarro knows he doesn't have Superman's experiential foundation. Days later, Superman and Hamilton have arranged to send Bizarro into space where he will land on a planet that is being used to test ambitious STAR Labs projects. Hamilton has linked those projects to Bizarro's mind, granting him the ability to shape the world in his own image. And then there's Bizarra, waiting for him. Love at last. 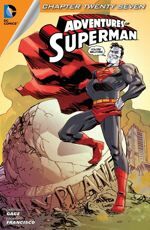 Story - 5: It was weeks early when Shawn asked if I'd cover reviews of Adventures of Superman for a couple of issues in October, as he was going to be traveling. I was more than happy to agree, not just because Shawn's a countryman and kindred spirit besides but also because I was keen to add to the unorthodox approaches he'd been taking with some of his reviews, especially his adoption of Bizarro-voice on issue 3, which of course featured Bizarro. And honestly, I could not have know the story we'd get during my turn on the title would also feature Bizarro! Anyway, that's the first reason I followed suit with Bizarro-voice. It's fun! The second reason is that the inspiration for "Flowers for Bizarro," Flowers for Algernon, is a classic with which I am familiar, though it's been so long I don't recall many of the finer details. I do recall (and it's easy to confirm) that Flowers for Algernon is written in large part as diary entries from the point of view of Charlie, a custodian who undergoes surgery to augment his intelligence. The surgery has already been shown to be successful on mice (Algernon being the eponymous mouse), and Charlie's story parallels that of Algernon, who becomes exceptionally intelligent before ultimately reverting to his original state. I was expecting the same to happen with Bizarro here, and am quite pleased to say that Gage went a different direction and left Bizarro's enhanced cognition intact while giving birth to Bizarro World and an all-around rounder character in Bizarro himself. Thus the top grades. It's a sensitive and poignant variation on a classic - not to mention the (contextually appropriate) happy ending neither Charlie nor Algernon got, no doubt because, especially in the 1950s when the original story was published, the majority of such stories didn't end that way. Anyway, thanks for indulging me. I'm sure that kind of subversion of the standard review form isn't for everyone, but it sure was fun. Art - 4: Francisco's pencils have an unsettled roughness that suits a Bizarro story, though I really didn't care for the hairstyle he put on Superman.